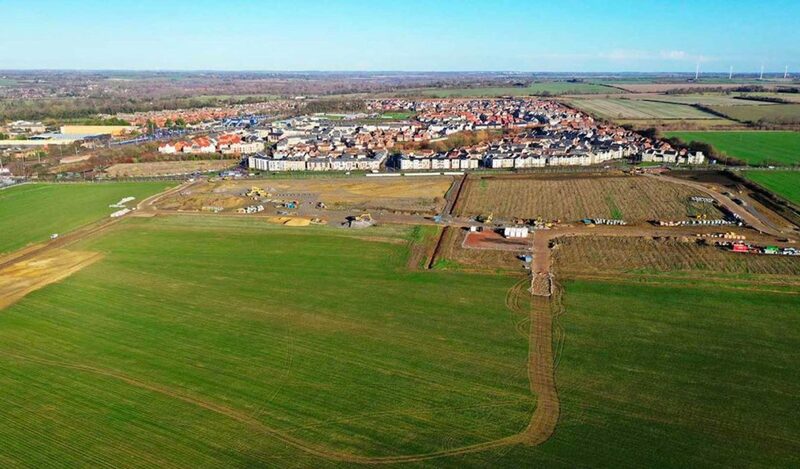 Early infrastructure work has started to reinforce the existing utility network and bring utilities into the new Wintringham development. The work is taking place hand in hand with creating a new landscape along the front of Cambridge Road, with earth bunds being put in place to create green space and a pedestrian and cycle way at the front of the development. Local contractor, Breheny, has a traffic management system in place that is using traffic cones to help guide vehicles using the Dramsell Rise and Stone Hill entrances, to support ongoing work as part of reinforcing and upgrading the services running along Cambridge Road. The next stage of work – putting in the new entrances – is likely to require a single traffic light management system that will be moved as the work progresses. Details will be confirmed over the next few weeks. In the longer term, the construction access will be from the A428 for the remaining phases of the development and should not impact the main entrance points from Loves Farm and the St Neots route to the A428. Deliveries will also take place within these hours, however every effort will be made to reduce deliveries during peak hour traffic of 08:00 – 09:30 and 15:30 – 17:30 from Monday to Friday whenever possible.